of 4,0 - 8,2 mm width. 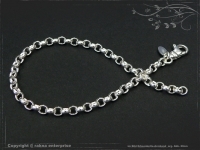 All the Belcher Chains Bracelets, conforms in their building a anchorchain Bracelet, are available in lengths from 16 - 25cm (in 1cm increments). Special lengths are also deliverable on request. width. 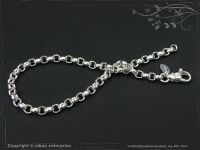 All the Belcher Bracelets, are available in lengths from 16 - 25cm (in 1cm increments). 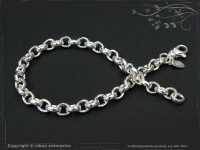 The Belcher Bracelets conforms in their building a anchorchain however, are much softer shaped and thus very feminine. Belcher Bracelet lenght 25,0 cm with karabiner lock an very feminine Women Bracelet made of 925 Sterling Silver ..
Belcher Bracelet lenght 24,0 cm with karabiner lock an very feminine Women Bracelet made of 925 Sterling Silver ..
Belcher Bracelet lenght 23,0 cm with karabiner lock an very feminine Women Bracelet made of 925 Sterling Silver ..
Belcher Bracelet lenght 21,0 cm with karabiner lock an very feminine Women Bracelet made of 925 Sterling Silver ..
Belcher Bracelet lenght 20,0 cm with karabiner lock an very feminine Women Bracelet made of 925 Sterling Silver ..
Belcher Bracelet lenght 22,0 cm with karabiner lock an very feminine Women Bracelet made of 925 Sterling Silver ..
Belcher Bracelet lenght 19,0 cm with karabiner lock an very feminine Women Bracelet made of 925 Sterling Silver ..
Belcher Bracelet lenght 18,0 cm with karabiner lock an very feminine Women Bracelet made of 925 Sterling Silver ..